Yokogawa ’s WT3000-2A and WT210 digital power meters are now certified to carry out the standby power tests specified in the new IEC 62301 standard. IEC 62301 has been introduced in response to the growing awareness of limited energy resources and the need for power savings in household electrical appliances. The digital power meters were tested by Kema Quality, an independent global accredited calibration laboratory and a leading authority in energy consulting, testing and certification. Both the WT3000-2A and the WT210 digital power meters complied with all requirements for test equipment specified in the IEC 62301 standard. Standby power refers to the electrical power consumed by equipment or appliances when they are switched off or in a standby mode. Typical examples might be a DVD recorder set to record in timer mode or a dishwasher timed to make use of off-peak electricity tariffs. Measurements of standby power are generally regarded as challenging because general-purpose power meters do not usually have the accuracy to measure low power values of less than one watt accurately. Key parameters whose limits are specified in IEC 62301, all of which are met or exceeded by the Yokogawa digital power meters, are total harmonic distortion (THD), crest factor, accuracy, resolution and stability at different power levels, and the ability to record true average power over a period of more than five minutes. 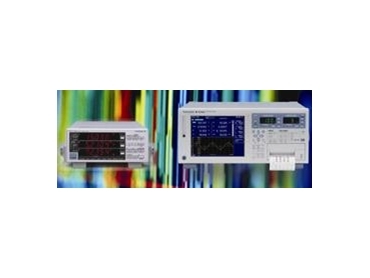 The WT3000-2A digital power meter is ideally suited to R&D and laboratory testing and evaluation, and the WT210 is designed for use in the production environment.